I've been having a vehicle dilemma lately. For the last 12 months or so we've been running an extra two vehicles. My wife has a car for her work and I've got a car to drive the kids about in and a van for my weekend and school holiday work. Trouble is this has meant having three cars, three to tax, three to break down etc. 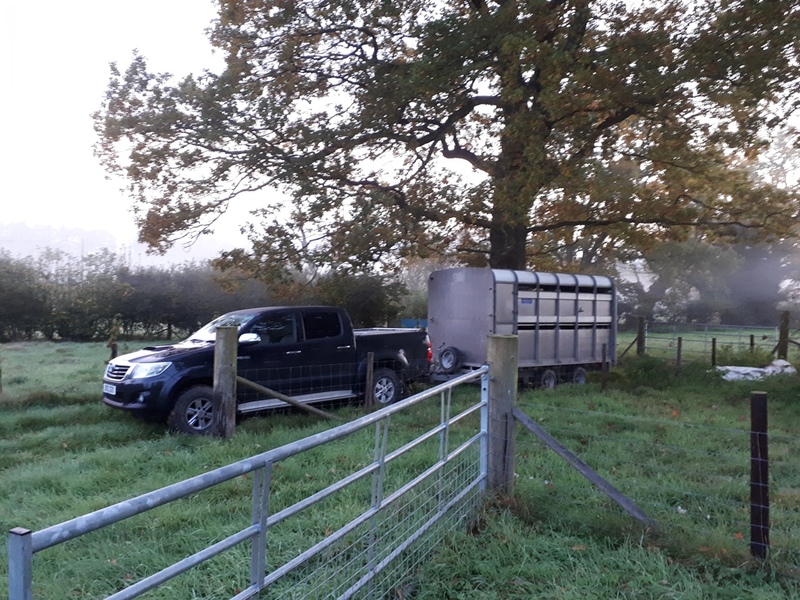 The other thing is although I had a tow bar fitted to my van it still couldn't move many sheep in one go (just take some to the abattoir but no more). Dad came up with and found the solution. Sell the car and the van, buy a pickup. I know the pickup won't be ideal for work, and it'll cost more in fuel but I don't travel out of the village for anything much. But it means I can now run one vehicle and when I move my sheep I don't have to keep asking dad to help out. Three kids also fit easily into it! I've owned many vehicles over the years but this is my first 4x4 and it's already been handy! My brother and my dad have owned many over the years and the first time I drove on the road was in a Landrover (I was 11 with a trailer but that's a story for another time if you're interested...). I'll miss the van and the space for work but I think this might work for me. Need to get a back and a roof rack now! What do you think? Would you be happy with such a big vehicle? Our son bought a very old hilux as they had similar problems. He thinks it is great but wouldn’t want to use it every day as it has no power steering and he often has a duff elbow! This one has a lot of mod cons! Most modern building I've had! Funny thing is I am going in the opposite direction. I have owned a Toyota T-100 4x4 pick-up going on eighteen years now and I barely use it anymore. Got a used Honda van for cheap money and find it so much more practical for work. A can is certainly more practical for work, just couldn't fit three kids in it and the wife! Did you have your truck fitted out to hold your tools? Having a 4x4 is handy round here as well. No, I don't have racks/shelves for tools in it. Just chuck them in as I need them for each project. It has a 4x8 foot bed so it is handy for carrying full sheets of ply. Has a fiberglass cap with a roof rack on the bed as well so I can carry longer dimensional lumber. But the bed is quite high so I am always lifting heavy gear like compressors, saws and tool boxes high to get them in. I find the van so much handier. Much better fuel mileage, better handling for the long drives. It is lower slung so I don't hurt myself loading tools in it, and it has five doors so I don't have to crawl on my knees to fetch something way up front. You know I'm a red neck Harry! Shotgun rack might get me locked up round here! A friend the other day asked if I had sunburn on my neck (in October) I had to say that from a lifetime outside it stays that colour now! We have two cars at the moment Kev. Mine is a great little runner for going shopping and getting the boys around to various things. 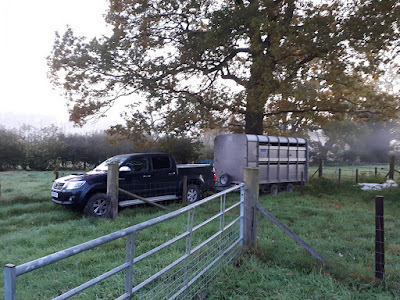 Jon has a renault scenic which he loves and even though he can get anything in it and pulls a trailer, too, he wants a more practical sort of pick up and we are also close to buying a proper quad bike so we can finally get into our field. We so want to get it ready for pigs and sheep hopefully, eeek, and so we can get to a tonne of trees that need cutting down. we have a landrover defender 110 and a nissan note. Works well for us. I am so jealous right now. The question of our next vehicle is a hotly debated one. We need towing capacity. I want a truck. My husband argues for a minivan (horrors) stating that it is basically a covered truck. We've hauled deer, straw, chickens, drywall and a cast iron bathtub in my dad's minivan. Ok, fine, but still it has an air of "giving up" about it. It pains me to say he'll probably win.